The Pumpkin Spice is Here!! Do you love pumpkin spice anything? I know I do, yesterday I was at the market and they had cereals, granolas, pasta sauces, cookies and even protein bars. I was a little shocked. I knew it was a major thing but I was not aware that it had gone to even savory products. Sugar Bowl Bakery has their offering of pumpkin spice in the fabulous Madeleines! I love these without the pumpkin spice but the addition of the perfect amount of spices and you have a major hit on your hands here. I know that in the past I have written about how delicate and cake like the Madeleines are and these are the exact same way, but they are a little touch better with the addition of the great flavors of fall! We made a cream cheese dip and dunked them and it was just so awesome! The dip is so simple too. Just mix one jar of marshmallow fluff with an 8 ounce brick of cream cheese and you are ready to dip. The flavor of them together was like a pumpkin roll without of the work. I love when I have something that I can serve guests that are easy and still an elevated flavor and with the Madeleines this is a simple task, you could dunk into chocolate or vanilla icing or you can also just eat them plain like my husband likes them. The Madeleines are sweet but not overly so and they offer a great coffee side kick! When I had these awesome pumpkin spice Madeleines with my coffee it was like drinking flavored coffee with a great little cake. If you are having a Halloween party or just having some people over for a gathering these little Madeleines from Sugar Bowl Bakery are the perfect little snack to serve. Check out the store locator here and you can find them easily near you. Make sure you are following Sugar Bowl Bakery on Facebook and Twitter they always have great ideas and serving suggestions for all of their sweets! It’s March 14! Which makes the date 3.14….Happy Pi Day! In honor of this fun and delicious day, Tales From a Southern Mom has teamed up with Wholly Wholesome to bring you an amazing recipe, and a tasty giveaway! It seems that desserts are another one of those “there are two types of people in the world” categories: Cake People and Pie People. My husband is firmly a cake person. He really could go the rest of his days without ever eating pie again, but he would happily eat cake every day. So naturally, for Pi Day, when I was presented with the opportunity to make a delicious pie and share it with you wonderful readers, my mind first went to sweet treats. But then I thought again. And I asked myself, “self, what is YOUR favorite pie?” And the answer may come as no surprise to you- my favorite pie is French Chocolate Silk. But, a very close second would be pretty much the whole category of savory pies. And you know what? My take pie or leave it hubby absolutely adores savory pies too. And so do most people I know. I can’t name a single person that doesn’t list Chicken Pot Pie in their top 10 of comfort foods. While contemplating my recipe choice, I also considered that in the years since World War II, people are spending less and less time in the kitchen preparing meals and relying more and more on premanufactured food items. So not only are health issues such as gluten sensitivity on the rise, but people are seeking products that closely replicate that feeling of love and security that comes from foods literally made with love. That’s where Wholly Gluten Free comes in. This is a line of gluten free products including pie shells, that are baked in a dedicated gluten free bakehouse to guarantee no risk of trace gluten. The mission of Wholly Gluten Free is to provide a product to cooks that are superior in taste, ingredients and production standards. They seek to create foods that are “wholicious” (wholesome and delicious), that are the best performing gluten free products available and with an ingredient list that consumers can trust as everything is declared and no labling law loopholes are at play. The pie shells used for this recipe contained no artificial colors, flavors, preservatives or additives and no GMOs. The product is easy to work with and is interchangeable in most recipes with either a traditional homemade crust or a storebought crust. I personally found it to be most similar to the prerolled pie crust disks you can buy in 2-packs in the refrigerated section of the grocery store. The oils in the shell do soften quickly at room temperature so if you are planning to do a lot of detailed decoration, I suggest you plan accordingly to add a bit of freezer cooling time into your prep. It was a little more oily to work with than a standard homemade recipe, probably due to the lack of trans fats. The final product is delicious, has a nice texture and not heavy. I also would compare it to most storebought, ready made pie crusts. Very easy to use, and you can stash an extra in the freezer for handy use. Wholly Wholesome has teamed up with Tales From a Southern Mom in honor of Pi Day and their new Gluten Free product line and is offering one of our lucky readers the opportunity to try two free Wholly Wholesome or Wholly Gluten Free products! Be sure to enter the giveaway! ONLY VALID for 24 HOURS ENTER NOW!! So in honor of this gastronomical revelation or revolution, if you can call it that, I bring you a recipe I created based on several savory meat pie recipes shared with me by a dear friend in England, where savory meat pies are a part of the every day cuisine. A new twist on two classic English pies, Steak and Ale pie and Steak and Bleu cheese pie, this recipe is sure to be a crowd pleaser. It is super versatile as well, it adapts well to any crusts and can be made in a pie pan, in a deep skillet and serve slices family style, or make into hand pies. Either way you choose, it’s delicious! *I used a pressure cooker to speed things along since I didn’t want to be in the kitchen over a hot stove any longer than necessary. But you can just as easily cook the meat in the gravy in a sauce pot for a couple hours on the stove. Start by cutting the bacon into 1/3′” pieces with scissors and in a large pressure cooker or pot, render the fat, cooking til bacon is slightly crisp. Remove bacon from pan. Toss beef pieces in flour and brown quickly in the bacon fat, being careful to not overcrowd the pan. Remove and add more beef too cook, in batches, until it’s all browned. Deglaze pan with bottle of ale, making sure to scrape up all the bits on the bottom. Add water, beef base, parsley, thyme, beef, salt and pepper and bring to a simmer (at this point you would continue to simmer for about 1.5 hours if not using a pressure cooker.) If using a pressure cooker, lock the lid and wait for the pressure to build and the cooker to whistle, then reduce heat and let cook for about 30 minutes. Remove from heat and run cold water over cooker to release the steam pressure. While the beef is cooking, you can caramelize your onions. you’ll need to slice them thin, and for that I use a mandolin slicer. Then I cook them in butter in a large pan, stirring frequently, until they are golden and delicious. Once the beef is removed from the heat and the lid can be removed, add the caramelized onions and taste. Add additional Thyme, salt and pepper if needed. Roll out your crust and line a 10-12″ skillet. Fill with the steak and onion mixture. Top with Bleu Cheese. Roll out your top crust, lay over the pie, roll the edges and vent and decorate however you see fit. Bake at 400* for 35 minutes and enjoy!! Do you love PEEPS? My husband is a huge PEEPS fan and every time they come out with new ones we are buying up all he can find it is sometimes a little crazy, but he thinks they are the best candy that is out there! 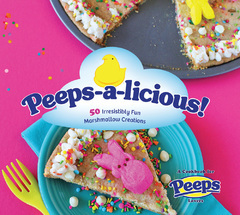 I had never thought to make anything out of PEEPS besides Easter Baskets, until I saw this awesome book called Peeps-a-licious, this features 50 recipes that are PEEPS inspired from some favorite food bloggers. I had no idea there were so many things you could do with a PEEP. There are Easter, Christmas, Valentines, and even Thanksgiving recipes for you to try your hand at baking and cooking with PEEPS! There are also lots of PEEP styled cupcakes, pops, cookies, cakes, brownies and more. I am looking forward to making the No-Bake Lemon PEEPS cake, as those are two of my husbands favorite flavors. This 128 page full color dessert cook book has simple and complex recipes for just about any occasion you can think of. If you love PEEPS or like me have a PEEP lover in your house this is something you are going to want to get and hang on to. Just Born, Inc. is a family-owned candy manufacturer that has been in business since 1923. Just Born is the manufacturer of PEEPS, MIKE AND IKE, HOT TAMALES, GOLDENBERG’S PEANUT CHEWS, TEENEE BEANEE Gourmet Jelly Beans, and JUST BORN Jelly Beans. Just Born acquired the Rodda Candy Company of Lancaster, PA, in 1953. As a result of the acquisition, the PEEPS Chick was “hatched”! What once took 27 hours to make by hand with a pastry tube was cut down to a 6-minute process through mechanization created by Bob Born, son of founder Sam Born. On average, more than 5 million PEEPS marshmallow confections are made every day in the USA. For over 60 years, PEEPS has traditionally been an iconic brand found in Easter baskets everywhere. Today, PEEPS Brand marshmallows can be found in a variety of colors, shapes, flavors, and sizes and for all seasons. Do you wanna bake the BEST Sourdough Bread at home?? Everyone loves a fresh, hot loaf of bread. But a lot of people are intimidated by bread baking. And for a long, long time, I too was one of those people. Now I can say with confidence that most bread recipes are fairly straightforward and can be successfully accomplished by any baker. But for some reason, people (again, myself included!) continue to be terrified of sourdough. Well, I’m here to tell you that sourdough bread is perhaps the MOST easy of all the breads to make! What’s that you say? Easy? Are you sure? YES! I’m sure! And I’m going to teach you how. I will use two recipes, one for those who want to make and keep a starter and one for those who don’t want to have to worry about keeping a starter going. Again, a starter isn’t scary. If I can keep one alive, ANYONE can. I have gone a month or more forgetting to feed mine and it always bounces right back. Whisk together the flour, yeast and salt in a large mixing bowl. Add the water and stir until combined. Cover the bowl with plastic wrap and allow to sit at room temperature for 19 hours. Alton recommends the 19 hours. I personally recommend more like 36 hours for super tangy sour taste. You can throw it in the fridge if you feel the need. But its not necessary. After 19 hours, turn the dough out onto a lightly floured work surface. Punch down the dough and turn it over onto itself a couple of times. Cover with a tea towel and allow to rest 15 minutes. After 15 minutes, shape the dough into a ball. Coat hands with flour, if needed, to prevent sticking. Sprinkle the tea towel with half of the cornmeal and lay the dough on top of it, with the seam side down. Sprinkle the top of the dough with the other half of the cornmeal and cover with the towel. Allow to rise for another 2 to 3 hours, or until the dough has doubled in size. Oven baking: While the dough is rising the second time, preheat the oven to 450 degrees F. Place a 4 to 5-quart Dutch oven in the oven while it preheats. Once the dough is ready, carefully transfer it to the pre-heated Dutch oven. Cover and bake for 30 minutes. Remove the lid and bake until the bread reaches an internal temperature of 210 to 212 degrees F, another 15 minutes. Transfer the bread to a cooling rack and allow to cool at least 15 minutes before serving. Outdoor coals: Heat charcoal in a chimney starter until ash covers all of the coals. Place 20 to 24 coals on a Dutch oven table. Place a cooling rack (or other wire rack that is at least 2-inches high) directly over the coals. Set a 5-quart Dutch oven on top of this rack and allow to preheat during the last 30 minutes of the second rise. Carefully transfer the dough to the Dutch oven and cover with the lid. Place 20 coals on top. Bake until the bread reaches an internal temperature of 210 to 212 degrees F, about 45 minutes. Transfer the bread to a cooling rack and allow to cool at least 15 minutes before serving. 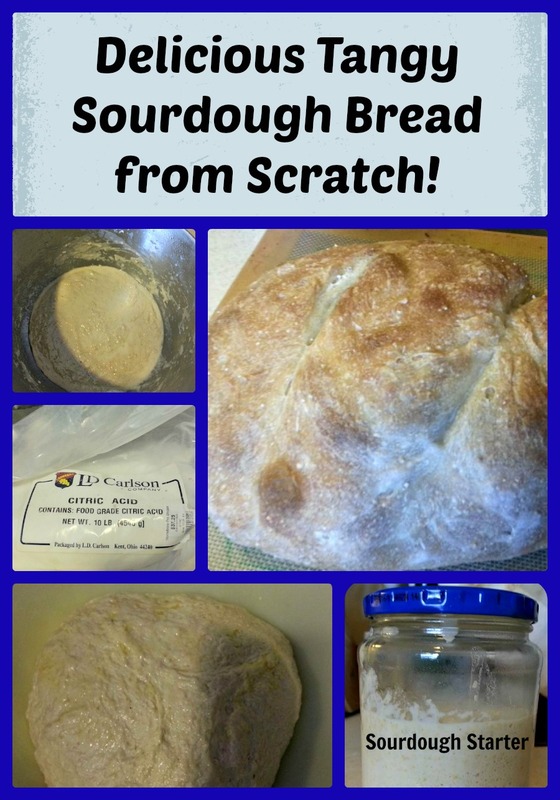 This is a super easy, super high “Ahhhhh!” factor bread that requires no kneading. And for those who want to start a starter and keep it going, here are the instructions for a starter as well as my personal favorite sourdough bread recipe. Combine the starter, water, and 3 cups of the flour. Beat vigorously for 1 minute. Cover, and let rest at room temperature for 4 hours. Refrigerate overnight, for about 12 hours. Add the remaining ingredients: 2 cups of flour, sugar, salt, and sour salt, if you’re using it. Knead to form a smooth dough. Allow the dough to rise in a covered bowl until it’s relaxed, smoothed out, and risen. Depending on the vigor of your starter, it may become REALLY puffy, as pictured; or it may just rise a bit. This can take anywhere from 2 to 5 hours. Understand this: sourdough bread (especially sourdough without added yeast) is as much art as science; everyone’s timetable will be different. So please allow yourself to go with the flow, and not treat this as an exact, to-the-minute process. Gently divide the dough in half. Gently shape the dough into two oval loaves, and place them on a lightly greased or parchment-lined baking sheet. Cover and let rise until very puffy, about 2 to 4 hours. Don’t worry if the loaves spread more than they rise; they’ll pick up once they hit the oven’s heat. Towards the end of the rising time, preheat the oven to 425°F. Spray the loaves with lukewarm water. Make two fairly deep diagonal slashes in each; a serrated bread knife, wielded firmly, works well here. Bake the bread for 25 to 30 minutes, until it’s a very deep golden brown. Remove it from the oven, and cool on a rack. To make starter, all you need is STONE GROUND flour of any sort. It must be stone ground to contain the wild yeasts necessary to get your starter going. I have crafted starters from stone ground amaranth, even stone ground corn meal. Anything is fine as long as it’s stone ground. Then you basically put equal parts water and grain in your starter. My first starter was 2 oz of regular all purpose flour, a pinch of sugar to feed the yeast, 2 ounces of stone ground amaranth and 4 ounces of water. You let it sit at room temp and stir every 12 hours and every 24 hours you take half out and add 2 ounces of flour and 2 ounces of water. After a week it should start to smell of bread, beer or alcohol. It’s now ready to use! Today I tried a new starter strain and I used a few spoonfulls of my old starter, 2 ounces of stone ground corn meal, 2 ounces of all purpose flour, 4 ounces of water and 1/4 tsp of commercial packaged yeast. It is already bubbling away on my counter and I’m pretty excited to use it! Spring celebrations wouldn’t be the same without one classic centerpiece: roasted lamb. The American Lamb Board offers inspiration and simple guidelines for preparing the perfect roast, along with a fresh twist on the beloved mint jelly. 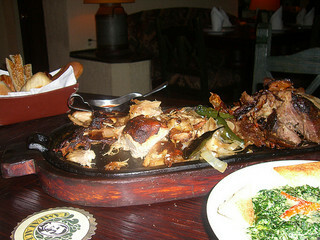 Roasting is a dry heat cooking method, well-suited to lamb cuts such as leg, crown roast, loin, shoulder and rack. The perfect roast results in a crispy brown exterior and a moist, tender interior. Ask your butcher to help you select and prepare your cut-of-choice. 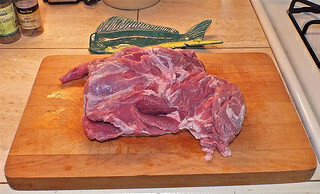 For example, a butcher can remove the bone from a leg of lamb, or “french” a rack of lamb, simplifying your prep work. For best results, bring the meat to room temperature before cooking it. Sear the outside of the meat for the first 10-20 minutes, sealing in the meat’s juices and flavors. Roast slowly at 325 degrees for approximately 15-20 minutes per pound. Let the meat rest for 15 minutes after removing it from the oven, to help it retain its juices. For medium rare, cook meat to an internal temperature of 135 degrees; for medium, cook to an internal temperature of 150 degrees. Keep in mind that the temperature of the meat will rise another 5-10 degrees after it’s removed from the oven. For a new take on the traditional roasted leg of lamb, consider swapping conventional mint jelly with a vibrant “mint chimichurri” made with fresh mint, garlic cloves, parsley leaves, capers, black pepper, salt and olive oil. American Lamb Board’s newest recipe, Roasted Boneless Leg of Lamb with Fingerling Potatoes, Leeks, and Mint Chimichurri, calls for seasoning the leg of lamb from the inside out, resulting in a more intense, juicy roast. Click here to watch a video demonstration of this simple spring lamb recipe! The American Lamb Board is an industry-funded research and promotions commodity board that represents all sectors of the American Lamb industry including producers, feeders, seed stock producers and processors. The Board, appointed by the Secretary of Agriculture, is focused on increasing demand by promoting the freshness, flavor, nutritional benefits, and culinary versatility of American Lamb. The work of the American Lamb Board is overseen by the U.S. Department of Agriculture and the board’s programs are supported and implemented by the staff in Denver, Colorado. 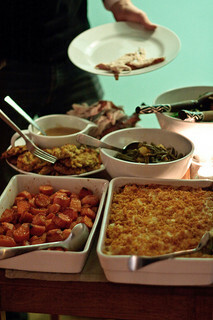 As the holiday season comes closer we all are looking for new recipes and how to do things differently. In all my years of cooking, I have found that when you keep things simple it seems to go over much better with a crowd and makes things much easier for the cook. I know sweet potatoes are normally on the menu for a lot of homes and I have gathered this information for your feasts from truebake.com. They have lots of help and advice over there! Many people love to eat sweet potatoes because of their pleasing taste, appetizing aroma and soft texture. They are usually boiled and fried. 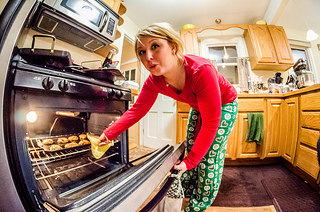 Aside from these cooking methods, baking is another way to bring out their sweet fine taste. By learning how to bake sweet potatoes, you can have something special and enticing to serve for breakfast, lunch or dinner. This particular task is classified as moderately easy. However, you need to gather some important ingredients first before you can start cooking such simple but delicious dish. Among them are 1/8-teaspoon salt, 2-tablespoons of margarine or butter and 2-tablespoons of brown sugar. 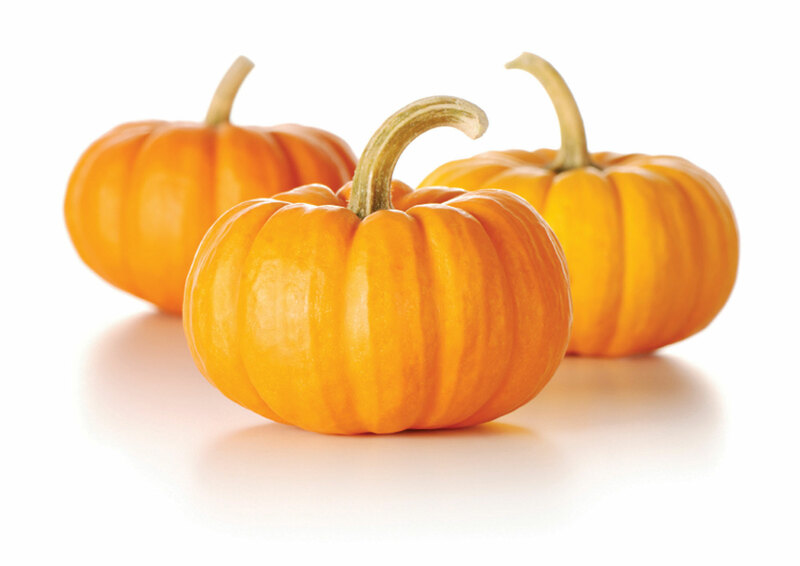 Additionally, do not forget to bring 2-tablespoons milk, ¼-cup sour cream as well as 6-pieces of medium-sized sweet potatoes. After collecting these items, you can start baking sweet potatoes right away. Once you are ready to start, set the oven to 375 degrees Fahrenheit. Get a fork and then use it to pierce the sweet potatoes. This will actually help release the steam once you bake them. After that, place them in a nice clean dish. Put it inside the oven and the bake for approximately 45 minutes. Once the sweet potatoes are tender, remove them from the oven. Slice each of them into half, preferably lengthwise. 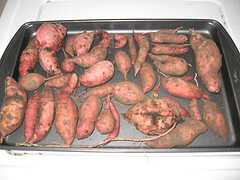 Scoop the sweet potatoes out of their skins and then place them in a large clean bowl. Set the skins aside for later use. Mash thoroughly until the sweet potatoes become soft and tender. Add the milk and sour cream over the mashed sweet potatoes. Follow them up with other important ingredients like the salt, butter and brown sugar. Mix thoroughly until the mixture becomes fluffy and light. Position the peels on top of the baking dish. Scoop the mixture back right into the skins. Set the oven to 400 degrees Fahrenheit. Without cover, cook the dish for approximately 25 minutes more. Be sure that the dish acquires a golden brown color. Before serving, put some butter and nuts on top of the dish. Serve and enjoy. According to many culinary experts, it is not advisable to put uncooked sweet potatoes inside the refrigerator for more than a day or two. When baking, it is good to understand what type of sweet potatoes you are using. When cooking the dry variety, you need to cook quicker compared to the moist variety. Never overcook this appetizing treat so that your guests can actually taste the pleasant goodness of this simple but delicious recipe.